Best known for its alluring cities, sumptuous cuisines, rich art history and stories from days gone by, this is a culturally diverse continent that oozes charisma. Our unusual adventure holidays in Europe venture off the beaten track and into the region’s little-known gems. Paddle over 400km on the Yenisei, horse ride through the Caucasus in Georgia, cycle Spain’s Camino de Santiago, hike Slovenia’s Mount Vogel, or get a taste for the Atlantic and sail to the Azores or island hop in the Med. Once you’ve caught your breath, unwind with a fairy tale vista and a glass of red. Prepare to be romanced by Europe. Live the life of a sailor. Sail as fast as possible to Cape Verde with a stop in Tenerife along the way. 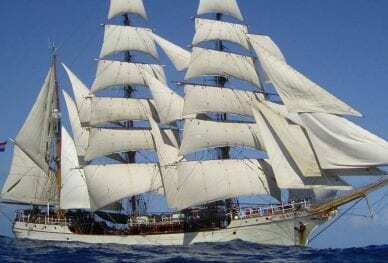 Sail the English channel and the coastlines of Spain and Portugal on this 16 day tall ship voyage.